It's been just over a year since I received my TGIF prank menu in the mail. 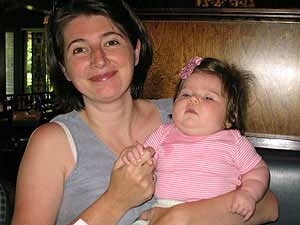 I had intended to infiltrate the restaurant in Tucson, AZ where we were living at the time but a move back to Canada and the birth of our daughter distracted me and it was only last month that I discovered the unused menu in a box in our basement. This coincided perfectly with a scheduled visit to my mom's in Portland, OR for the 4th of July. I filled her in on the concept and she was excited to be my partner in crime. 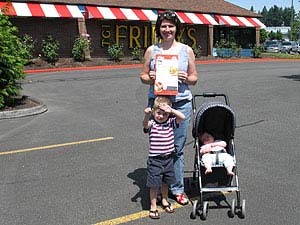 The only TGIF's near her was the very same one in Tigard that Taylor W. visited with his prank menu before anyone else. What a fitting finale to such an excellent prank! We planned our strategy the night before. 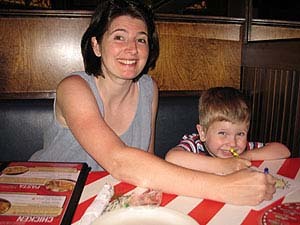 My mom would hold the camera, we'd bring my kids and she'd take their pictures while I made the menu switch. My mom lay awake that night wondering if we'd get caught. She knew that they'd been hit before and worried whether they had taken preventative measures in the past year. 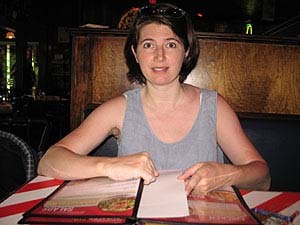 She imagined new, stronger, sealed menus requiring exacto knives to open, and labels that read "Tampering with menus punishable by fine or imprisonment". We got there at 11:30 am. Too early for a lunch rush, but it wasn't empty. 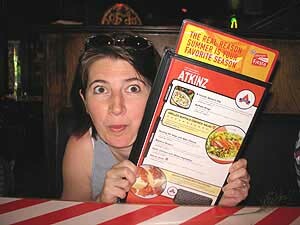 We asked for an inside booth for greater privacy and I quickly checked my menu to ensure that the Atkins page hadn't been replaced with a South Beach page, or a Golden Ring page. Luck! They still feature that diet and the menus are as easy to tamper with as ever. I was so impressed by how well Rob copied the style. My mom took some pictures of me with the kids and after the waitress took our drink order I quickly pulled the fake menu out of the business portfolio we had hidden it in. It was a tight squeeze and I had a moment of panic when it was only half way in and a waiter walked by. He smiled at me, He knows! I thought as he passed, imagining he'd just come out of a staff meeting about exactly this sort of thing. Oh my god, oh my god, take the picture quick!!! My mom got two more and it was over. Whew! I couldn't believe we pulled it off! Now all we had to do was eat our lunch, which proved to be the greatest challenge of all. The food really isn't very good. Frances didn't care though. She ate 1/2 my club sandwich and most of my mom's pecan-encrusted chicken salad, neither of which are ring shaped. Tsk tsk! Jackson had cheesy noodles but cried when he found out they were out of "Cup of Dirt". Thanks Rob, for coming up with so many brilliant ideas. We had so much fun and my mom believes she now may be your most senior fan. Terms and Conditions Copyright 2005 Cockeyed.com although Serena wrote this and took the photos.